Late last year Will Gibney, a long term SELOC member, club Regional Liaison and former Lotus owner was diagnosed with Renal Call Carcinoma, an (as yet) incurable form of kidney cancer. Last month Will posted up a Driving Bucket List thread of activities he’d like to try out, and encouraged others to post their thoughts and ideas. Unbeknownst to him the SELOC community took this list and decided to see what they could do to help, drawing on contacts and the generosity of the clubs members to see what they could do to help him achieve his goals. 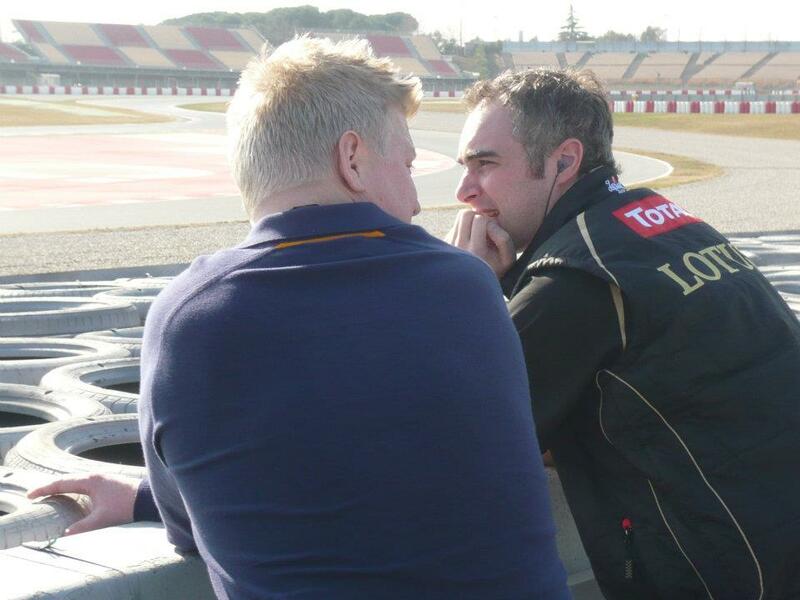 This week, SELOC sent Will and his Dad to Barcelona to spend an afternoon with the Lotus F1 Team as they took part in pre-season testing ahead of the 2012 F1 season. Will has kindly allowed us to reproduce his report. If you would like to find out more about his condition and experiences then be sure to check out the Will’s List blog. The other day my phone rang as I was just getting into my car. It was James Thorburn, one of the SELOC directors. I still haven’t really figured out the telephone system in my car yet so I asked if I could call him back once I’d got going as I’d inadvertently cut him off if I tried to transfer the call part way through. He told me it was probably best I wasn’t driving as he had some exciting news for me, and he was certainly right about that. James told me that SELOC had formed a secret forum that I wasn’t able to see, and the members had donated some money to pay for me to fly out to Barcelona to be with the Lotus F1 Team for their final pre-season test in Barcelona on Thursday. I know I’ve been going on about SELOC a lot on this blog, but this goes to show what an amazing little community it is, and I am absolutely blown away by the thought and generosity it’s members have shown me, and I’ll never be able to thank them enough. We had an early start (3:00am) on Thursday and got driven to the airport by my friend David. It was really foggy the whole way down which slowed us down a lot, but luckily we had checked in online and walked pretty much straight onto the plane and straight into the next surprise. One of my pilot friends, Simon had managed to upgrade us which was fantastic, and also swapped his rosta round so he could fly us out himself. I was a bit concerned when he came back to have a chat mid air, but it was a pleasantly uneventful flight. As soon as we landed, we picked up the car and headed straight to the circuit. 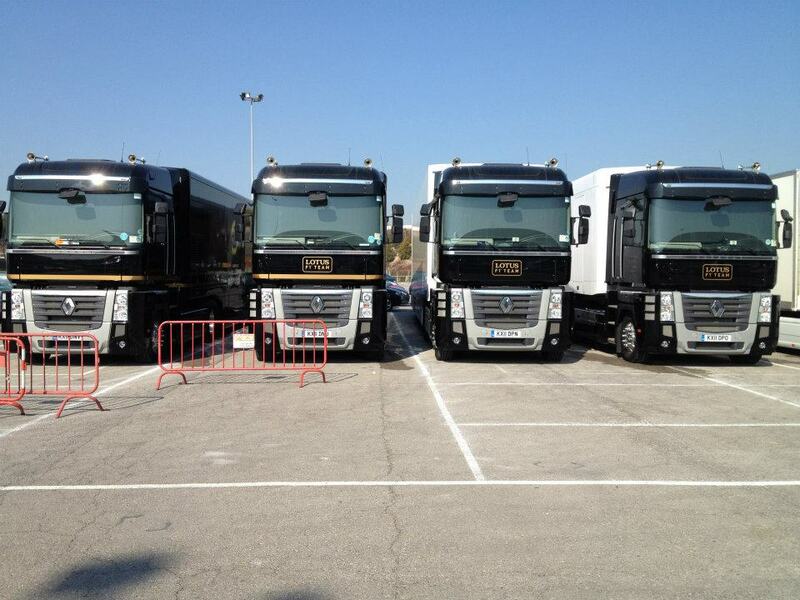 We parked up in the paddock and then had a few hours to kill until the tour started that afternoon. We had a walk through the paddock and sat in the grandstand for a while right in the middle of the start/finish straight. The noise was absolutely incredible, especially from the Caterham, which sounded like it was exploding every time they changed gear (it did finish the day on a trailer). Then we noticed a load of people across the other side of the circuit on the roof of the pits all had the same neon-yellow passes we had. We walked over and straight past security onto the roof. We had access everywhere! 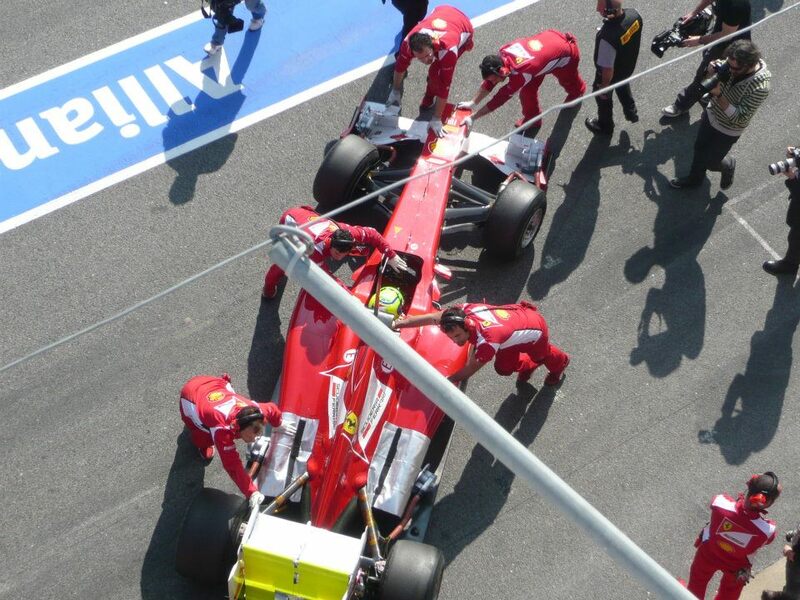 It was great to watch them practicing pit stops from directly overhead. At one o’clock, out tour started so we made our way to Lotus’ mega motorhome / building and introduced ourselves to our guide for the day, Matt. Dad and I turned out to be the only two people on the afternoon tour so we had Matt’s undivided attention. We had a chat over lunch and he was telling us what it was like being involved with F1 for over ten years. It sounds like an incredible life, but it’s not all glamour. He told us some of the pit crew had been working with the team (under various team names) for over twenty years. The guys work really long hours and spend months away from home at a time without seeing their families. Most of them spend far more time with each other than their children. 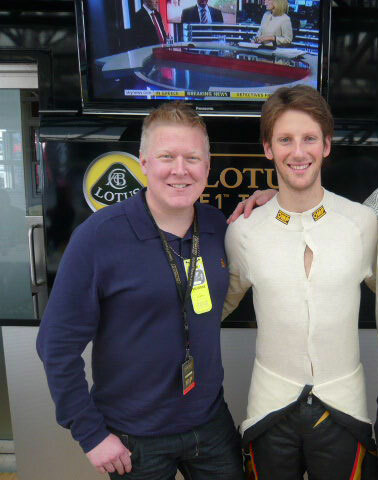 We then got the opportunity to meet their new driver, Romain Grosjean. He seemed like a really nice guy, but so small! As Dad said, he looked like he’d never seen a portion of fish and chips in his life, which as you’ll see from the pictures, is more than can be said for me after the hefty dose of steroids I’ve been slowly weening myself off! 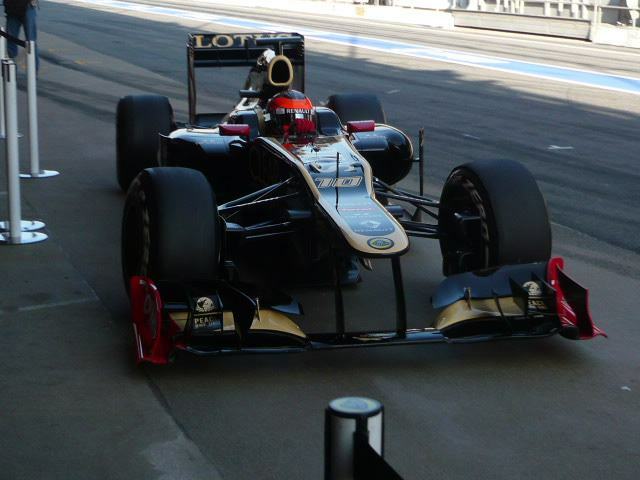 Unfortunately, Kimi Räikkönen wasn’t present for testing on Thursday, he started on the Saturday. Then the tour began and we were shown into the garage, and area that was screened off to the public on all sides at the time to hide what was going on inside. Photography was strictly off the agenda in here for obvious reasons, but the sight that greeted us when we entered was otherworldly. The car was on stands with all its bodywork removed and had a team of guys busily working away on it. Under the white lights and with the car’s life support system pumping it full of hot fluids and warming the tyres, it was like watching a body in surgery. I felt star-struck by the car its self. With the bodywork removed, you get a sense of just how skeletal they really are. One of Matt’s facts of the day was that each car has over 2,000 sensors. I can’t even begin to think of 2,000 different things that could possibly be being monitored. All of the data was being interpreted by a team of people in a back room in real time, as well as teams in the factory in Enstone and Paris. By now, the car was back together and ready to get back out on the circuit. It was interesting to note that plywood is still used for the rubbing boards underneath, and even F1 teams use Duck Tape for running repairs! 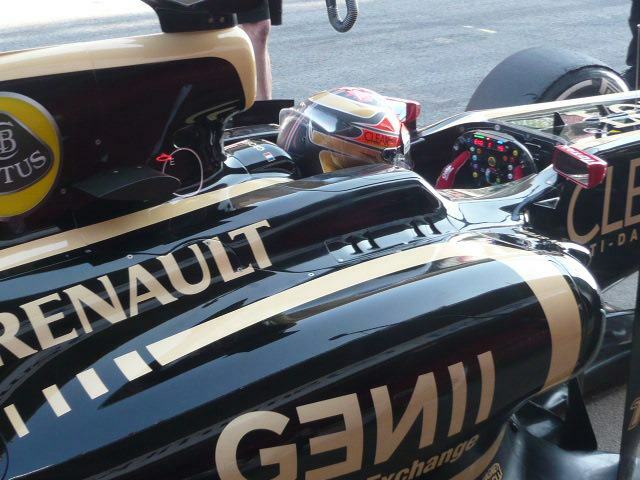 Another interesting thing was that the cars aren’t black and gold anymore. Apparently gold doesn’t show up on TV properly and was too dark, so the “gold” colour is actually a flat light beige! Next we were taken out in a minibus for a tour of the circuit’s perimeter roads. It was incredible driving alongside the cars as they overtook you at 200mph. The thing I found most impressive was how late they were able to brake after the main straight before the tight right-hander. It defied belief! We carried on round the circuit until we got to somewhere we were able to get out and watch for a while, completely surrounded by the circuit. It felt really special to be allowed into these areas and be so close to the cars on track. As we pulled up, Martin Brundle was walking past but we didn’t get chance to get a photo with him. The car approaching at speed! We then went back to the pits. In the afternoon, the team were running short sessions of three laps at a time and then returning to the garage and screening it off while they performed a few checks on the car and took tyre temperatures. Romain stayed in the car each time while they jacked it up and then went back out for another three laps. 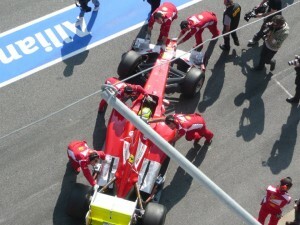 Every time he went back out, we got to stand right in the pit lane next to the mechanics. It’s an amazing sight to see an F1 car coming towards you at 60mph and braking at the last minute. As I said earlier, the brakes are phenomenal, but you still struggle to believe it really is going to stop without wiping you all out! We got to walk in and out between the garage and the pit lane for the whole afternoon until testing finished at five o’clock. We also got to have a look at and play with a steering wheel, which was definitely a complex piece of kit, although apparently when the drivers do a presentation, they are able to talk to the audience while making changes on the wheel at the same time without looking. We also got to have a look around the trucks, which act as a mini version of the factory with engine rooms and workshop. It was interesting to hear that both cars travel together in the same truck. That’s a lot of responsibility for one lorry driver! After the tour, we went back to the motorhome for a cup of tea and were presented with a great Lotus F1 Team goody bag. The whole tour was run brilliantly, and Matt was an excellent and very knowledgeable guide and host. It was also nice to hear that the drivers still get a kick out of the car its self, not just the competitive element of the sport. It’s nice to know they still think of it as special. Nico Rosberg sporting some stubble for 2012! 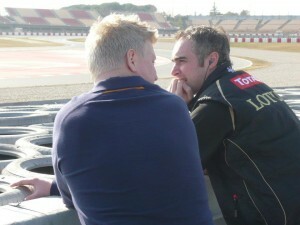 We then spent a while walking up and down the paddock while the drivers performed their press duties. 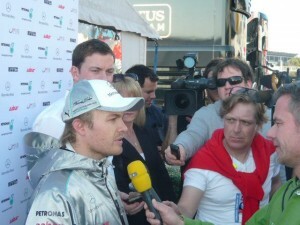 We saw Nico Rosberg and Filipe Massa, but missed Jenson Button and Mark Webber. Interestingly, Lotus and Romain set the fastest lap of the day, which can only be a positive sign for the coming season. They also said they learned some important information that could result in further significant steps forward in the future. We then left the circuit and headed to our hotel in the Barcelona Port which was fantastic and headed out for a bite to eat. I must admit, my healthy anti-cancer diet slipped slightly while I was away. I certainly made the most out of the breakfast buffet the following day! I’ll make up for it this week by eating more vegetables than humanly possible, I promise. On the last day, we decided to see a bit of Barcelona so jumped on the open-top tourist bus and saw pretty much ALL of Barcelona’s sights. It was a great was to see the city because you could just jump on and off the bus at the sights you wanted to see. 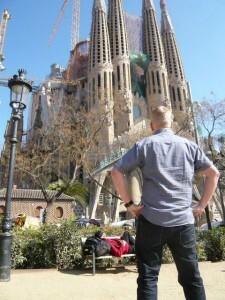 We got off at Sagrada Família, which really was breath taking. Everyone told me it was just as impressive in the flesh as it is in pictures, but to me it was even more so. Gaudi was clearly an absolute nutter, starting to build something that at the time was impossible, but they think they might finally have it finished in 2025! As he said, his client has all the time in the world. We also got off at the funicular railway, which takes you to the top of the mountain that overlooks Barcelona. At the top was a funny little amusement park for people with a death wish as well as another impressive church and a great little restaurant where we had lunch. We eventually got back to the UK late last night feeling completely knackered but buzzing from a really fantastic couple of days. We really couldn’t have packed more into our time there, and it is certainly somewhere I would recommend visiting. I will honestly never be able to thank SELOC and Lotus enough for giving me this fantastic opportunity. I know I’ve said it before, but I really do feel lucky to be part of such a special club. You gave my Dad and me some time together away from all the unpleasant stuff. I would like to thank the members of SELOC and my Dad for making the Barcelona trip possible. My words really can’t express how it made me feel. A special thank you to Kelvin Hughes who organised it with Lotus and James Thorburn for setting everything else up and giving me the good news BEFORE I was on the move! Thanks David, for getting up at 3:00am and driving us all the way to Heathrow through the thick fog before a full day of hard work, and Simon Ballard for a very memorable flight for all the right reasons. As a nervous airline passenger, it was strangely reassuring to hear you voice on the PA, even though I know you. I’d also like to thank out hosts at the circuit, Lotus, especially Matt Johnson for making the day so special, and Rachel Barnett, Dany Bahar’s PA who made the arrangements for our visit. Lastly, thanks to my Mum and Sister Harriet for picking us up from Bristol late on Friday night. I’m amazed you managed to resist the lure of Cabbot’s Circus on your way through…… Or did you? Article by Will Gibney (Gibney) and reproduced with permission from Will’s List.